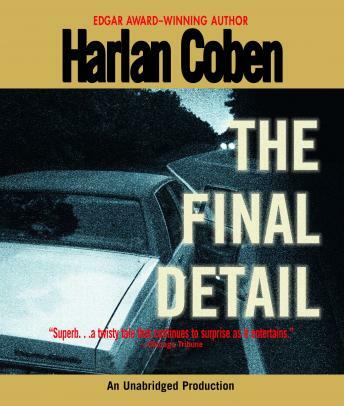 In this classic sixth novel in the award-winning Myron Bolitar series, # 1 New York Times bestselling author Harlan Coben delivers a riveting, powerhouse thriller featuring one of the most fascinating and complex heroes in all of suspense fiction. Here is a twisting mystery of betrayal, family secrets, and murder filled with the sly humor, dead-on dialogue, and unforgettable characters that have made Harlan Coben one of today’s must-read suspense authors. For Myron Bolitar, sports agent and reluctant sleuth, it was a long-needed vacation. A tropical beach. A warm breeze. A little uncomplicated passion with a woman he hardly knows. But, most of all, a chance to clear his head after the death of a close friend. It almost works—until his fiercely loyal, if sometimes morally challenged, friend Win shows up with a message that blasts Myron back to New York…and reality. Esperanza, Myron’s best friend and partner at MB Sportsrep, has been arrested for the murder of a client, a fallen baseball star attempting a comeback. Myron is determined to prove Esperanza’s innocence. But she isn’t speaking. And neither is her lawyer, except to say that Myron would do best to keep his distance, lest he hurt her case. Only Myron is already too close to the case to back away. For twelve years ago a young agent tried to help an up-and-coming athlete. It was a fatal mistake—and now Myron may have to pay the price. To solve a case as bizarre as it is difficult, Myron will be obliged to view it from the strangest angles: a transsexual nightclub, a baseball owner with a long-lost daughter, a dubious drug test, an impossible murder scene, and a computer disk with the image of a disintegrating girl. But most bizarre of all is that as he tries to unearth, Myron’s own investigation points to only one other suspect: himself…as this spellbinding novel twists, jolts, and careens towards its dazzling finish. A good Myron Bolitar story, but the narration was way too fast. A good Myron Bolitar mystery.